Spanish dishes are super tasty and you just must try them! We thought it would be good to share some of them with you. Some of them are very well known however, others might come as a little surprise. So let’s go ahead! Who doesn’t know Spanish rice dish called Paella?! However, you might not know that you may find lots of different types of Paellas. However, all the real paellas should consist of white rice which holds its shape so called Arroz de grano medio: Arroz Bomba or Arroz de Calasparra. To make it easier almost all Spanish shops have those type of rice clearly indicated as Paella rice on the packages. So do not worry you won’t need to search it for a long time if you decide to attempt to prepare your own Paella. Traditional Paella which originally comes from Valencia consists of rice, chicken, rabbit and surprise surprise it does not include seafood. Nowadays, you can find many different kinds of Paella. 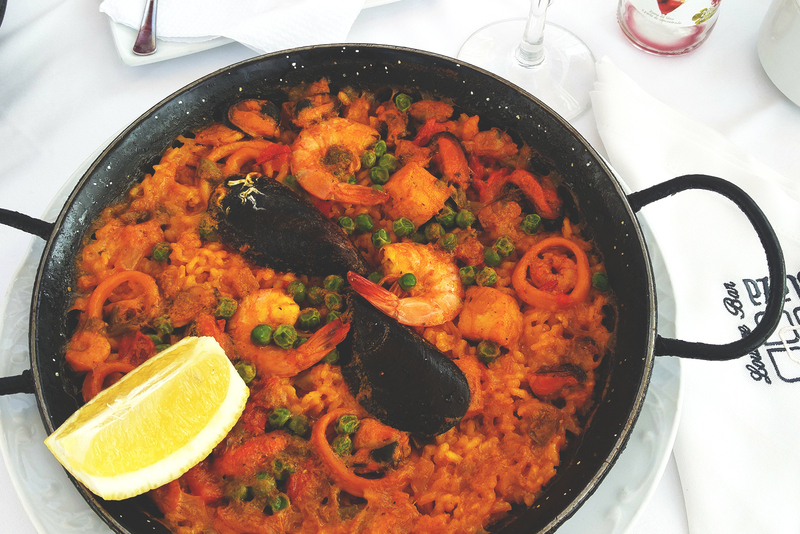 Vegetarian, seafood, mixed Paella or Black Paella are just a few variations of Paella available across Spain. Arroz Caldoso (soupy rice) is a dish very similar to the well-known Paella which is also called soupy seafood paella. It is less sticky and less dry version of the famous paella. It literally could look like soup with a lot of rice and many other ingredients inside. Same as the regular Paella, Arroz Caldoso can be with vegetables, Shrimps, lobster, crayfish and so on. It is a Spanish-style omelet made out of a lot of potatoes, eggs and other ingredients of your choice. You can find it with Jamon Serrano, spinach, goat cheese, sausage (chorizo), onion (cebolla) and so on. Normally you can order tortilla as a small portion called tapa or you can order it as a dish. Gazpacho It is chilli tomato soup which is very refreshing since it is served called and it is made from flavored Spanish tomatoes. The soup which origins come from the south region of Spain called Andalucia cannot be compared with any tomato soup found in the supermarkets across the world. Apart of the tomatoes, the soup contains green peppers, cucumbers, garlic, onions, vinegar, and different herbs. Salmorejo is a similar version cold soup to the Gazpacho. However, normally it is combined with pureed bread, tomatoes, garlic, and vinegar. You might find it containing a small piece of ham or egg as well. Prawns in fried garlic or so-called gambas al ajillo which is made out of small Spanish prawns which are normally cooked in a hot olive oil, roasted garlic and small chilli giving the dish a unique taste. If you are a prawns lover you just must to try this dish. One of our favorite dishes from Spain is Galician style Octopus. It is usually served on a wooden plate with boiled or roasted potatoes a little bit of olive oil, coarse salt, and paprika. The dish can be found in any seafood oriented restaurant or even in the fresh seafood markets across Spain. Maybe Risotto could not be called the traditional meal of Spain. However, in some Spanish restaurants, you can get super tasty risotto which for sure you would like to try. If you find somewhere Risotto with Boletus, Tartufata and Duck ham just grab it and enjoy the amazing taste of it. Another maybe not so typical meal, however, very enjoyed by locals is called wok. It is a dish made out of the Chinese Noodles which is served with different ingredients. You can find many different kinds of woks from the very basic to the ones containing for example Vegetables, Iberian sauteed sausage and soy sauce. If you haven’t tried it yet, we would really recommend trying wok with the shrimps! We hope you enjoyed this small summary of main dishes which you can find in Spain. Some you probably already knew others might be that not but we really felt the need of giving some credits to these amazing dishes. Do not forget to share your favorite dishes of Spain. Stay tuned since we are sure that there is going to be more blogs about incredible Spanish food coming soon!